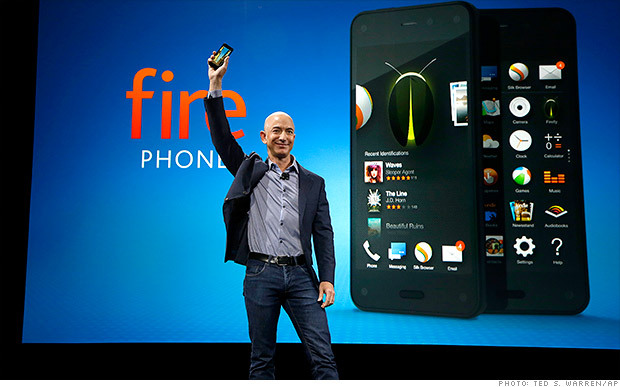 Amazon just announced one of their biggest creations yet, the Amazon Fire Phone. It took Amazon four years, but it was finally unveiled at an event in Seattle. Yes, it is a cellphone, but Amazon wanted to go above and beyond that. They wanted their cellphone to be apart of every decision that you make throughout the day. Whether it be deciding on where to eat for your ten-year anniversary or which song to listen to even if you can't remember the name of it, Amazon has you covered. Now of course, this cellphone, among many others, will still have some competition on its hands. However, Amazon may just have the upper hand when it comes to the Fire Phone. Amazon not only wants to please their customers, but they want them to live in an "Amazon themed world," where everything can be "identified, listed, ranked, shared and of course ordered." With the phone’s "dynamic perspective" you can tilt, swerve, and auto-scroll, and your phone will follow those movements. The phone also gives you the ability to "peek" in the Amazon Shopping app, which allows you to see clothing and shoes up close to make sure that what you're buying is what you want. In addition to what was mentioned above, there is also the all new "Firefly" technology. This allows you to quickly identify pretty much anything. Whether it’s movies, books, or even QR and barcodes, you'll never have to use Google again. There is also a built in Firefly button on the left hand side of the phone, so at the click of button it will pull up references and answers to whatever you are looking for. Also, if you're ever having any troubles, the 24-hour, seven-days-a-week Mayday service is always by your side at the touch of a button. The service lets experts draw on your screen, flip between pages, and even search something for you. When looking for a phone, most people don't just look for the service, or how much data it can hold, but they also look at its camera. To capture moments that may never happen again or to record that video of your graduation day, the Fire Phone has got you covered. With 1080P HD video, as well as a 13 megapixel camera system, you can capture everything that you want to and for as long as you want due to the free unlimited Cloud Storage. It can also backup all of your pictures and videos to Amazon's Cloud Drive, in case something were to go wrong. This phone has it all. With up to 285 hours of standby time, 2GB of ram, you're set for just about anything. Not to mention that it comes loaded with one full year free of Amazon Prime. If you got some spare cash just laying around, you better start saving up. The Fire Phone's price tag is anywhere from $200-650, depending on the plan that you have. For a phone like this, the price tag is fairly reasonable. Will you be picking up this phone? Do you think that Apple and other companies like it will finally have a run for their money? For me, I cannot afford to have a phone like this, but if I could, I would. EA is Changing to Become "Player First"